There are a lot of people struggling with their weight right now. The message has gotten out that carrying too many extra pounds is bad for your health. The word “obesity” is now part of the common vernacular. People are searching for ways to cut down on the extra weight that seems to have crept upon them. Some try diets, others turn to exercise, but many still find that they just can’t shake their spare tire. Part of the problem is that a person’s metabolism plays a role in how successful any weight loss program will be. Your metabolism is the rate at which your body burns calories to be used for fuel. Some bodies burn calories quickly, helping to prevent extra calories from being stored as fat, while other people find themselves somewhere on the “slower” metabolism spectrum. Calories aren’t burned efficiently and have to be redirected and stored in the body instead of being used immediately as fuel. So what can you do if you have a slow metabolism? Well, unfortunately, there isn’t a lot you can do if you just happen to be one of those people that burns calories at a slower rate. Watching your caloric intake may help, as will keeping active. But if you’re being careful about what you eat and getting in a workout every day and you’re not seeing any improvement in your weight, here’s an unusual approach to weight loss: ear acupuncture. In a recent trial, researchers tested acupuncture in the ear of 58 obese participants. 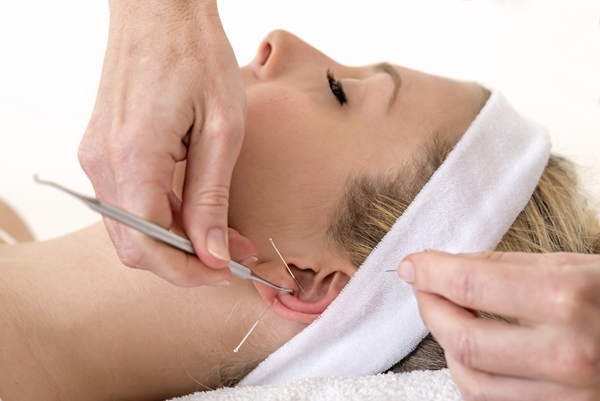 A team of researchers compared two different methods of acupuncture: the first involved putting an acupuncture needle in five different points on the outer ear, while the second method utilized a single needle placed in a single acupuncture point. A third group was given sham treatment and acted as a control. The trial lasted eight weeks. Participants were asked to follow a restrictive diet, but not a full-fledged weight loss diet. The participants were also asked not to increase their physical activity levels. According to the researchers, the five-point acupuncture involved placing needles two millimeters deep into the outer ear. The needles were taped to hold them in place and the participants kept the needles under the outer ear skin for a week. At this point, the needles were placed in the other ear and the whole process was repeated. The group that received one needle had their needles removed right away. Results differed among the groups. After four weeks, the sham acupuncture resulted in zero weight loss for the placebo group. The one-point acupuncture group had a 5.7% reduction in weight, while the five-point acupuncture group experienced a 6.1% reduction in weight. Those receiving the five-point acupuncture showed a drop in percentage of body fat. Neither the one-point acupuncture group nor the placebo group experienced this beneficial loss of body fat. In ear acupuncture therapy, practitioners of traditional Chinese medicine follow the philosophy that the outer ear has specific acupuncture points that represent all the areas of the body. One needle may be placed in the area that represents hunger and appetite, while another needle will stimulate a different bodily process. The researchers explained that it is the combined effect of the five-point acupuncture that was responsible for the beneficial effects seen in patients with central obesity. They also stress that the five-point acupuncture needs to be continuous to be effective. Yeo, S., et al., “Randomised clinical trial of five ear acupuncture points for the treatment of overweight people,” Acupunct Med. December 16, 2013. “Ear Acupuncture May Hold Promise for Weight Loss,” MedlinePlus web site, Dec. 17, 2013; http://www.nlm.nih.gov/medlineplus/news/fullstory_143505.html, last accessed Dec. 18, 2013.